I came across a photo from years past of, well, let’s just say it was of close friends in a “highly entertained” state of consciousness (you know who you are). It reminded me of a very important lesson – always have really good leftovers on the day after St Patrick’s Day. Having pushed the envelope again with making far too much braised meat than a normal person could consume in a given week, I was lucky to have on hand a surplus of homemade corned beef and other accoutrements. 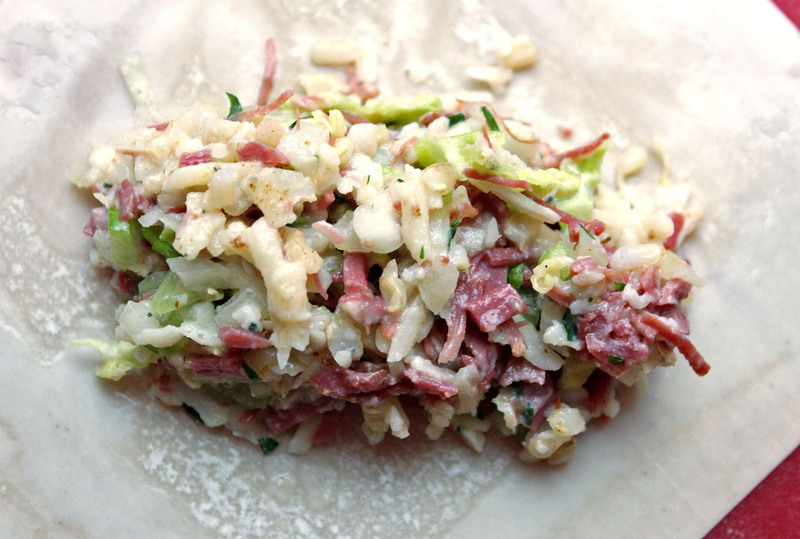 As we’ve mentioned in previous posts, the inspirational landscape of our refrigerator can sometimes be daunting, but here it was an easy decision to take the luscious corned beef and cabbage and make this simple midweek appetizer. It’s no wonder that some of the simplest dishes can be so heavenly, and this one delivered. The juiciness of the corned beef filling and crispy outer shell provided balance to the contrasting flavors. So too the life lessons continue – leftovers are just the beginning ingredients to another fine meal. In large bowl, mix together all ingredients. On a flat surface, place an egg roll wrapper and using fingers and small bowl of water, moisten all edges. Place 1/2 cup of filling in center of wrapper and top with thin slices of green cabbage, then fold bottom corner of wrapper over filling. Moisten edges again if necessary, then fold in both sides into center making sure to delicately tuck in edges to seal. Then gently roll to close completely, and place on baking sheet. Grate turnip and cucumber, and then drain in sieve squeezing out excess liquid. In a bowl, mix yogurt, sour cream, lime juice, mint, coriander, cayenne, garlic powder, then mix in turnip and cucumber. Place bowl in refrigerator to chill. add egg rolls. Cook until lightly golden on all sides, then return to baking sheet and bake at 350°F for 10 minutes. 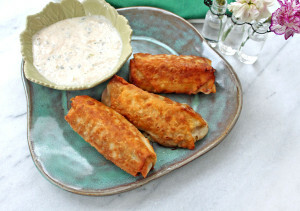 This entry was posted in Appetizers, Cooking, Spring and tagged Beef by cfaust. Bookmark the permalink.